If trying to find a new wine is intimidating to you, this easy to use iPhone app will set you at ease with it’s refined, concise interface and graphics. It focuses on fundamental criteria to find you a great glass of wine, whatever your taste may be. Approach Guides Wine, is an easy to use search engine for Italian wines. AG Wine refines your selection process by offering you their four “never fail approaches.” Start your wine search by choosing a grape, style, food pairing, or region. Also available on most vintages are a rating on the quality of the wine. I think it’s important to note that the ratings on this app are not generated from the app’s users, but the editors at AG Wine. The developer even included a video you can view to discover how the editors rate the wines. Included in each grape profile is the wine style, tasting notes from the editor, the region the grape is grown in, food pairings, and a clear description. Once you’ve discovered a tasty wine you can mark a grape as your “favorite” and post it to Facebook or twitter, and you can even email your tasting notes. If you do have any questions, take advantage of the Information button at the top of the screen, it’s unique to each page in the app. If you’re a connoisseur you can set a favorite region or style to narrow your future searches. 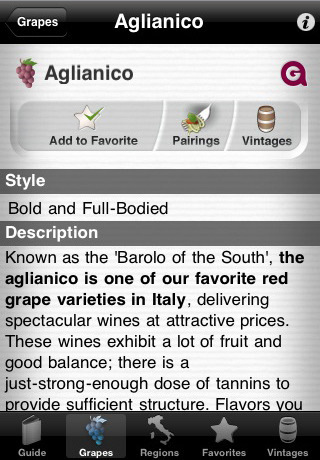 Since the successful release of this iPhone app, AG Wine advertises it will soon be introducing Spanish wines to their selection. All existing AG Wine users will receive an updated country wine selection for free. Another great thing about this app is that it is completely independent of advertising and selling. AG Wine does not sell any of the wines they list, nor do they advertise wineries, therefore, all opinions expressed by this iPhone app are unbiased. This pocket-sized sommelier is a great tool for a beginning wine drinker, or a novice. For a price of $3.99, I’d say it’s well worth the investment. AppSafari review of Approach Guides Wine was written by Amanda McFarland on April 6th, 2010 and categorized under App Store, Food, Reference, Utilities. Page viewed 6274 times, 2 so far today. Need help on using these apps? Please read the Help Page. Thank you very much, Amanda, for your review. We appreciate your taking the time to explore the app in such detail and are extremely pleased that you found it worthy of recommendation! Couldn’t agree more!!! This is a superb app for everyone. You can know nothing or a lot about wine and always find it extremely useful. While it’s not promoted as an educational tool, I have learned more about Italian wine by using this app than from the Wine magazines & books that I have read. Best part? … It’s only $3.99!!! Where else can you purchase all of this information organized in such a clear & concise way for under $4!?! Great job, AG! Terrific review Amanda! Please get in touch with me via my site when you have a moment. I just bought this app and it’s by far the best wine app I have ever own. It provides you with a strategy to pick a bottle rather than offering endless list of producer reviews which are most of time totally useless. The fact that no internet connection is required is also a big plus. There is an another app for wine lovers though when it comes to tasting notes (besides, it is a free app) : Taste A Wine for iPhone. I have tried over 7 different tasting note apps (including paying ones) and it is by far the best. It really conveys the feeling that is was made by wine tasters for wine tasters.